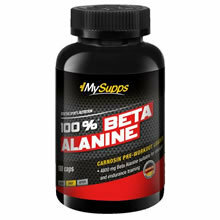 If you'd like to see if 100% Beta Alanine (Capsules) contains substances that are banned by your sports organization's Banned Substance List, sign up now or log in. Declared Ingredients Beta Alanine. Ingredients: Beta Alanine, Gelatin (Capsule shell (Beef)), Separating agents (Magnesium stearate). Have a question about 100% Beta Alanine (Capsules) Use our secure online messaging system to ask our Aegis Shield Experts.